A 32-inch television is of a good size, and is convenient for every room type, especially cosier spaces, such as a bedroom or study. However, the key to getting the most benefits is choosing a model that works for you. 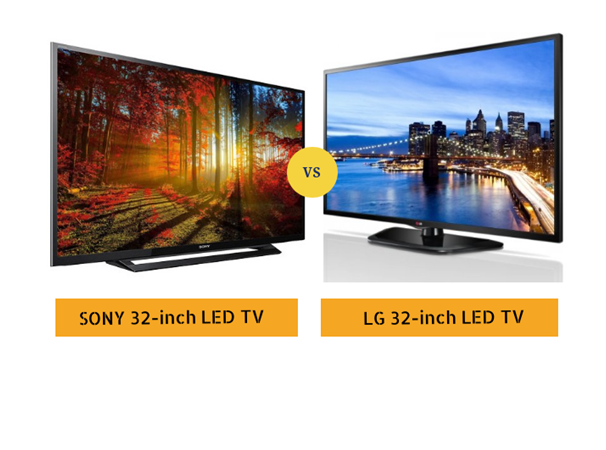 In your search, you may consider choosing between an LG 32-inch LED TV or a Sony 32-inch LED TV. The best way to decide is to weigh the benefits and prices of each. So, take a look at how Sony’s 32-inch W67F LED TV compares to LG’s 32-inch 32LJ522D LED TV. Both televisions have various technologies that improve your viewing experience. The Sony television features X-Reality Pro technology that makes every pixel clearer and sharper to avoid blurring. On the other hand, the LG television features an IPS panel display that provides a comfortable, natural viewing experience. It also has a Colour Master Engine that adjusts the hue, saturation and luminance to suit your preferences. The TV’s resolution is one of the most important factor that you can’t avoid when buying it as it is the base of picture quality. The Sony television features a Full HD display. The cine motion mode, graphic standard, clear resolution enhancer and other features are put together to bring the best out of every picture. This means that it provides refined images with reduced noise for a flawless viewing experience. In contrast, the LG television features a 1366 x 768 HD display that cleans blurry outlines of pixels and thus refines imagery. The Sony 32-inch LED TV price is Rs.39,900, while the LG 32-inch LED TV price is Rs.23,900. Given these details it is important to consider how much you want to spend before deciding. For a more affordable option, pick LG. When it comes to entertainment Sony LED TV constitute it with more depth, more reach and more impact. The Sony 32-inch LED TV has an in-built woofer system that provides cutting-edge audio. This lends itself well to music and movies. In comparison, the speaker system of LG 32-inch LED TV has a Dolby Digital Decoder and gives you access to various sound modes for a versatile experience. Both the LG 32-inch LED TV and Sony 32-inch LED TV have a sleek design and come with a sturdy, ergonomic stand. Both of them are with slim profile and can easily combined into your living space. It’s perfect for wall mounting and its discreet, narrow bezel allows you to place the television on any surface in your home. The thin screen of both these TVs ensures that it doesn’t clutter your interiors. The sleek appearance also makes mounting the TV on to the wall easy. While it is important to choose the best TV model, once you do, it is also essential to make your TV purchase more affordable. You can do this by shopping for the LG 32-inch LED TV or Sony 32-inch LED TV at the Bajaj Finserv EMI Store. Shop without any financial strain by choosing No Cost EMIs and pay using the EMI Network Card. This way you don’t have to pay anything beyond the MRP of the TV. At this store, you can also avail discounts, exciting cashback offers, and super-quick home delivery in just 24 hours. Once you make up your mind and add a LG 32-inch LED TV or Sony 32-inch LED TV to your cart, and check your pre-approved offer to simplify the shopping experience. Enter a few details to know the sum that you can avail to shop swiftly and then complete your purchase. Before buying you may read all about Sony LED TV here. Next article Men’s Wedding Bands: Explore the various options to zero in on the perfect choice!